On September 13, 1991 Sri Chinmoy offered a Peace Concert at the University of Illinois in Chicago with over 7,000 people. The video by Sukantika remembers this performance. Since 1986, many significant landmarks around the globe – from natural wonders over objects to entire nations – have been dedicated to peace as part of the Sri Chinmoy Peace-Blossoms programme. This clip shows Sri Chinmoy at the inauguratiuon of a Peace Train in Sicily in the year 1991. I remembered being there and saw how Sri Chinmoy enjoyed being in the driver’s seat of the train. In his childhood he dreamed of being a train conductor. Filmed and edited by Kedar Misani. 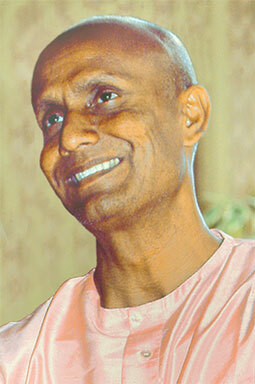 Sri Chimnoy was unique among spiritual Masters in demonstrating that sports can play a vital role in the life of a spiritual seeker. Himself a life long athlete, Sri Chinmoy encouraged his students to take seriously, both the challenges of the inner life, and the opportunities for self-transcendence offered by participation in sport. This short film looks back at the period in his life when he was to physically train and compete in distance running events. A film by Utpal Marshall. On January 14, 2016, a new statue of Sri Chinmoy (1931-2007) has been inaugurated in Sliema, Malta in the presence of local and international dignitaries. It is the 31st life-size bronze sculpture that has been established world-wide, the first being placed in Oslo on October 27th 2008. Malta is very much supporting the cause of peace manifested by the Sri Chinmoy Centres and the Peace Run inaugurated by Sri Chinmoy himself in 1987 (Photo by Kedar Misani). On January 7th, 2016, the Speaker of the Maltese House of Representatives Anġlu Farrugia (left) welcomed participants from all over the world taking part in the Sri Chinmoy Oneness-Home Peace Run 2016. The main purpose of the peace run is to highlight the importance of ‘oneness’, and of creating a harmonious environment for the peaceful coexistence of people with different beliefs and traditions. Anġlu Farrugia greatly welcomed the organisation’s incessant work to elevate and promote peace as a way of life, as well as its strategic outreach to world leaders as the true catalysts for change. As a matter of fact, the Peace Blossom Nation initiative, bestowed for the first time in 1998 on the Maltese Islands, is the noble and admirable concept of engaging and encouraging nation states to inject greater energy in the creation of a more just, full and equal world. In expressing gratitude for the Torch-Bearer Award and welcoming the activities which will be carried out with local schools in the coming days, Speaker Farrugia augured that the Sri Chinmoy Peace Run organisation continues to create a movement of peace, built upon respect for others, and mutual understanding of different traditions and religions. The ‘oneness’ concept became a reality when Anġlu Farrugia, Speaker of the House of Representatives, Chris Agius, Parliamentary Secretary for Research Innovation, Youth and Sport, and Frederick Azzopardi, Deputy Whip for the Opposition, held together the Peace Run torch as a symbol of political and national unity. This was a piece for a documentary on Sudhahota Carl Lewis which was filmed in 2004 by Mridanga Spencer.